Check out this gently-used 2004 Toyota Tacoma we recently got in. 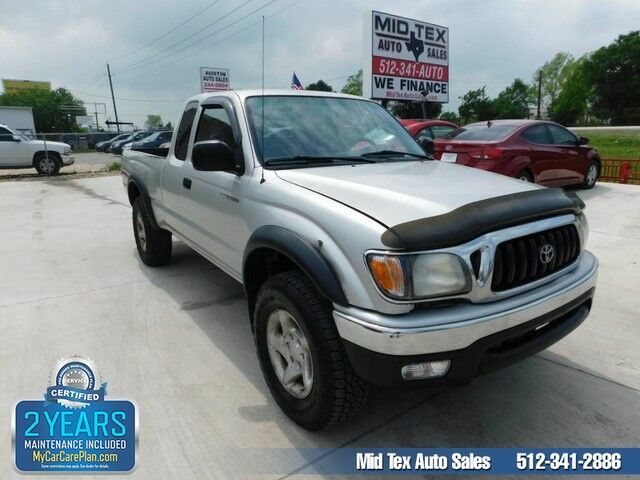 This 2004 Toyota Tacoma comes with a CARFAX Buyback Guarantee, which means you can buy with certainty. This 4WD-equipped vehicle will handle beautifully on any terrain and in any weather condition your may find yourself in. The benefits of driving a 4 wheel drive vehicle, such as this Toyota Tacoma , include superior acceleration, improved steering, and increased traction and stability. The look is unmistakably Toyota, the smooth contours and cutting-edge technology of this Toyota Tacoma will definitely turn heads. The quintessential Toyota -- This Toyota Tacoma speaks volumes about its owner, about uncompromising individuality, a passion for driving and standards far above the ordinary. Visit Mid Tex Auto Sales online at www.midtexautosales.com to see more pictures of this vehicle or call us at 512-341-2886 today to schedule your test drive.